Yeah! You and I are eating more fresh produce, according to the United States Department of Agriculture (USDA). This is good not only for our health but because fresh produce tastes so good! Between 1970 and 2008, U.S. per capita consumption of fresh vegetables increased approximately 67% ─ from 49 to 82 kg (107.9 to 180.5 lbs) per year (USDA 2008). From 1976 to 2007, U.S. per capita consumption of fresh fruit increased approximately 19% ─ from 38.2 to 45.5 kg (84.2 to 100.2 lbs) per year, also according to the USDA. But with increased consumption of our fresh produce has come increased outbreaks of food-related illness associated with these foods, spurring increased concern about the safety of fresh fruit and vegetables. According to the Center for Disease Control (CDC) and food experts, sporadic cases and small outbreaks in the home are far more common than recognized outbreaks that have come from the production and processing of fruits and vegetables. So our number one defense against foodborne illness is safety measures in the home. The list of safety tips produced by the Council for Agriculture Science & Technology (CAST) below gives you a series of strategies to make sure you’re properly handling your fruits and vegetables once you get them home. What are Producers and Processors Doing to Protect Us? But what are fruit and vegetable growers, including processing plants doing, to ensure safety? The fresh produce production and processing industry is implementing Good Agricultural Practices to decrease the risk of in-field contamination. These practices include proper site selection, water quality testing, runoff control, manure and compost management, domestic animal and wildlife control, worker health and hygiene monitoring, field sanitation of harvest equipment, and safe harvesting practices. In addition, packing house operators and produce processors use Sanitary Operating Procedures and Good Manufacturing Practices, which are common to the entire food processing industry and including sanitary design of equipment and facilities, pest control, facility sanitation, worker health and hygiene monitoring and temperature control. Sanitizing washes or dips, which rely on chlorine or other sanitizers to kill harmful microbes, are used. Many producers and processors also have developed or are developing systems to trace and recall products as well as detailed crisis management and farm security plans. Additionally, the federal government is looking into opportunities for improvement. While you might let your pet roam around in your backyard garden even while you harvest, today’s large produce growers fence off fields, regularly monitor their fields and rope off contaminated areas and harvesters are not allowed to harvest that crop area. But, the best defense against food contamination is found in the home. Remember to practice regular sanitation when preparing food. The tips below can help prevent food-related illnesses. 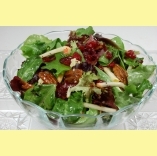 For salad, mix together greens, spinach, dried cranberries, pears, walnuts, and crumbled bleu cheese. For dressing, puree honey, vinegar, Dijon mustard, salt, and onion. Pour in vegetable oil and poppy seeds. Puree together. It is better to make the dressing ahead for time (even the day before serving) so the flavors can meld.